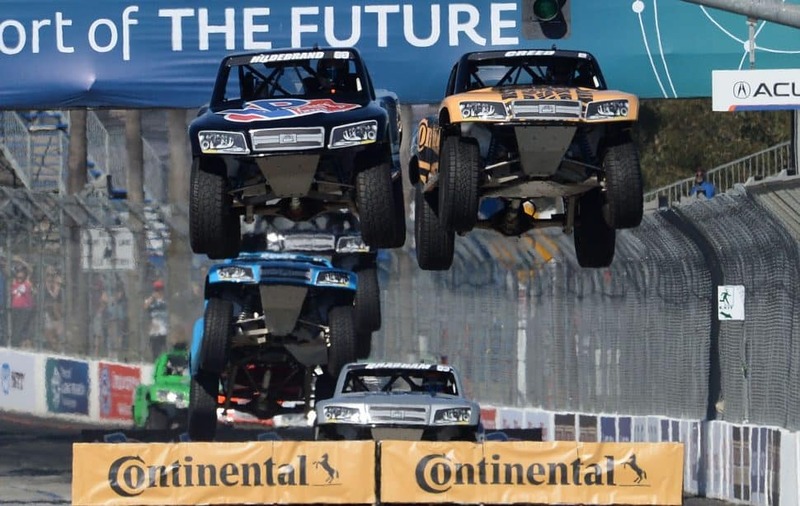 (L-R) Sheldon Creed and Matt Brabham fly through the air during the SPEED Energy Stadium Super Trucks race at the Acura Grand Prix in Long Beach on Saturday, April 13, 2019. Photo by Kelly Smiley. “Jumping trucks, jumping trucks,” a group of girls chanted together while waiting for the first Stadium Super Trucks race. “I want to see the monster trucks,” one little boy said excitedly from his dad’s shoulders. Kids squealed in delight as high-horsepower trucks launched into the air, engines roaring, and landed, bouncing on their tires along South Pine Avenue. 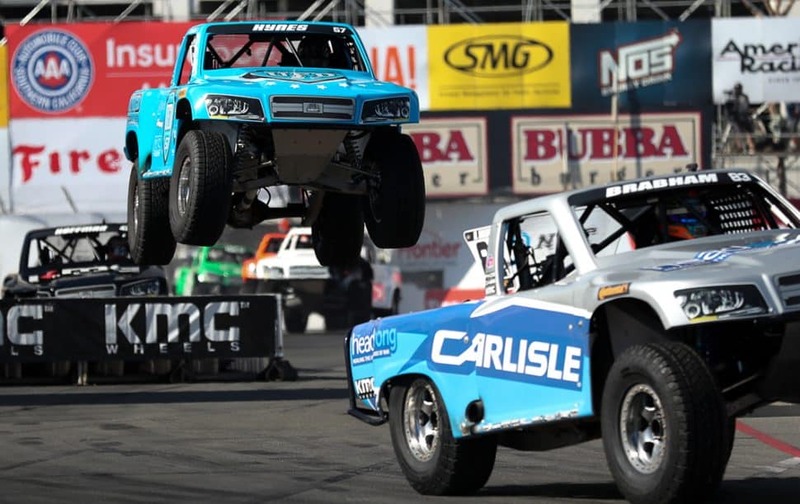 The smell of exhaust in the air, the crowd cheered each time the trucks went around the 1.97-mile track. With many holding their phones in the air recording the daring stunts, Saturday’s race was a crowd pleaser, with Matt Brabhm in the #83 truck winning the race. 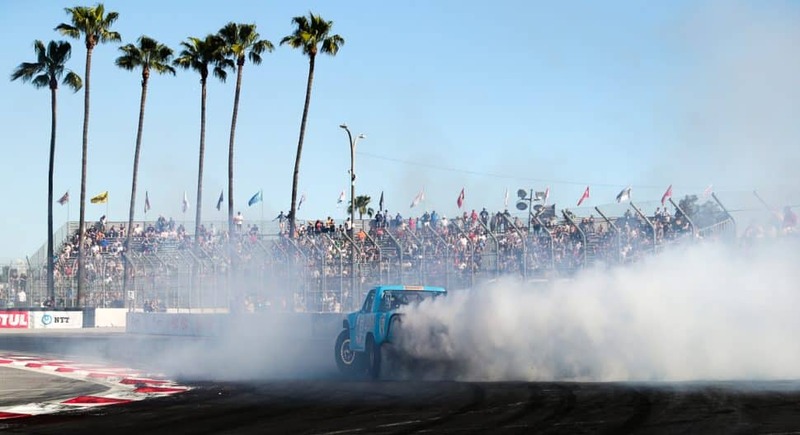 If you missed the first race, Sunday’s starts at 4:05 p.m.
Bill Hynes does a doughnut after the finish of the SPEED Energy Stadium Super Trucks race at the Acura Grand Prix in Long Beach on Saturday, April 13, 2019. Photo by Kelly Smiley. 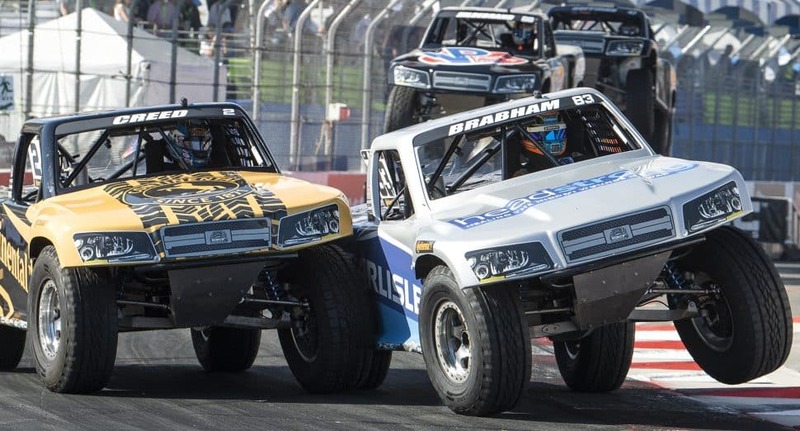 Robby Gordon drives in with a damaged front end during the SPEED Energy Stadium Super Trucks race at the Acura Grand Prix in Long Beach on Saturday, April 13, 2019. Photo by Kelly Smiley. 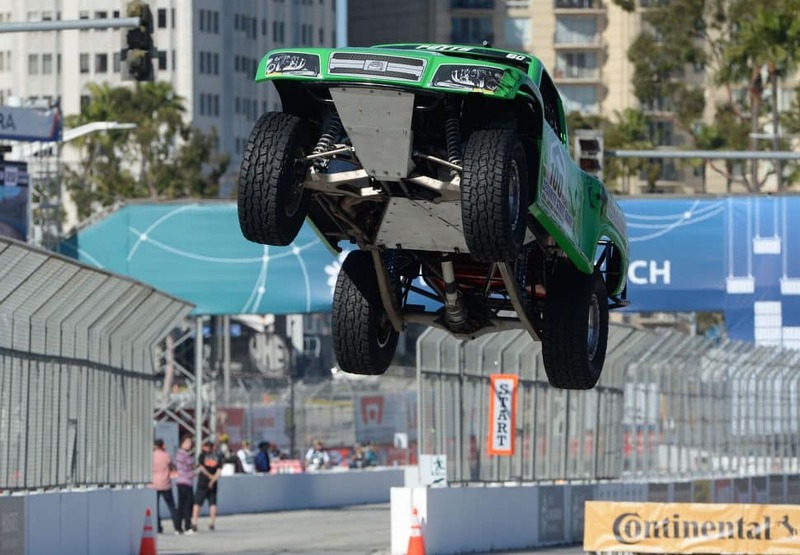 Bill Hynes flies through the air during the SPEED Energy Stadium Super Trucks race at the Acura Grand Prix in Long Beach on Saturday, April 13, 2019. Photo by Kelly Smiley. 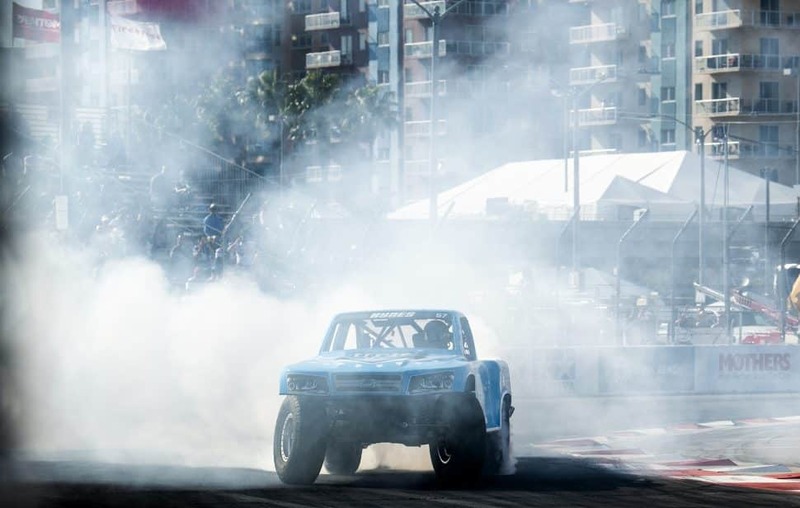 Bill Hynes #57 does doughnuts as he smokes his tires after the finish of the SPEED Energy Stadium Super Trucks at the Acura Grand Prix of Long Beach weekend in Long Beach Saturday, April 13, 2019. Photo by Thomas R Cordova. 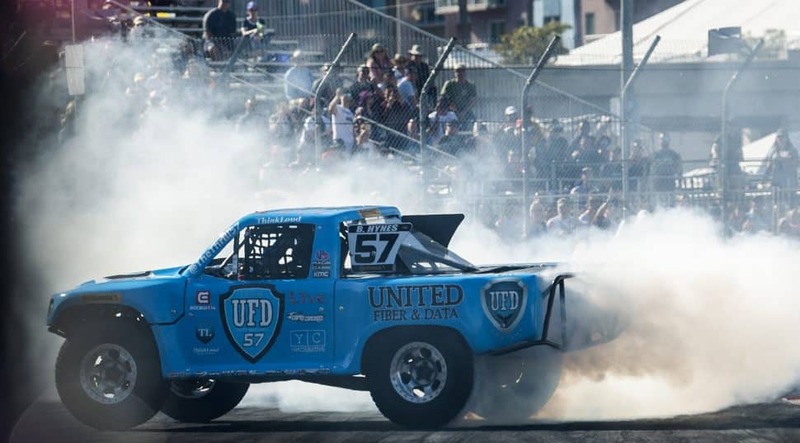 Bill Hynes #57 does doughnuts after the finish of the SPEED Energy Stadium Super Trucks at the Acura Grand Prix of Long Beach weekend in Long Beach Saturday, April 13, 2019. Photo by Thomas R Cordova. 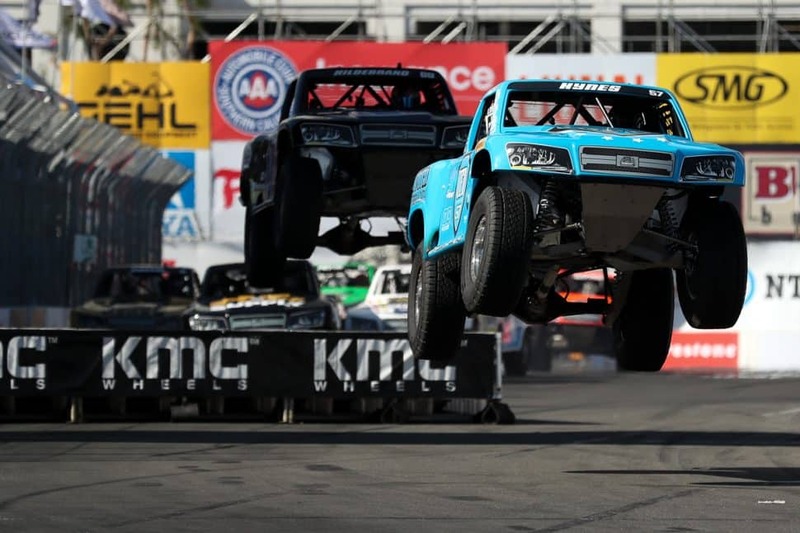 Matt Brabham #83 goes on three wheels as he battles Sheldon Creed #2 left, coming around a turn during the SPEED Energy Stadium Super Trucks at the Acura Grand Prix of Long Beach weekend in Long Beach Saturday, April 13, 2019. Photo by Thomas R Cordova. 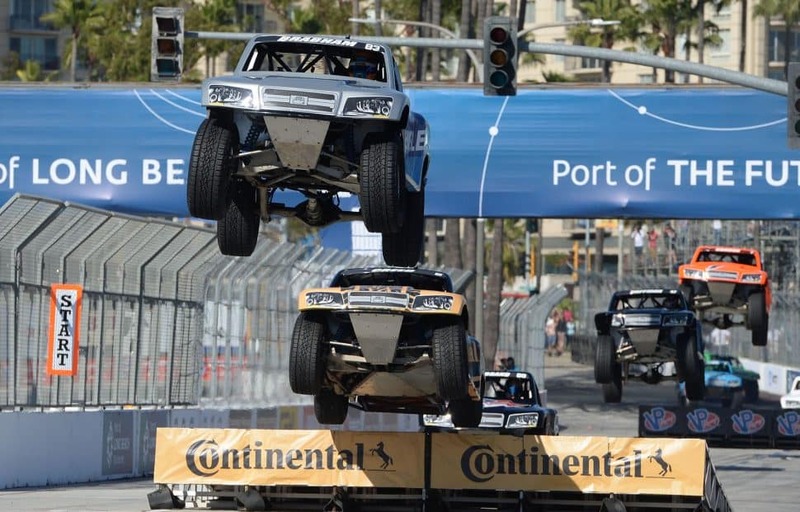 Sheldon Creed #2 left, and Matt Brabham #83 battle for first as they hit a ramp during the SPEED Energy Stadium Super Trucks at the Acura Grand Prix of Long Beach weekend in Long Beach Saturday, April 13, 2019. Photo by Thomas R Cordova. 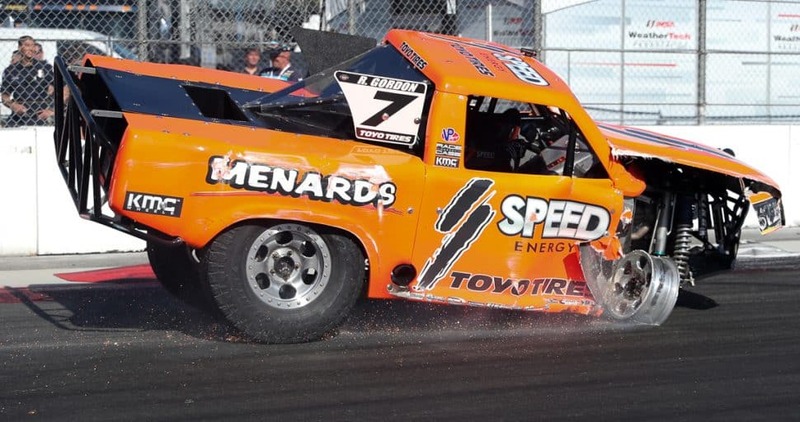 Robby Gordon #7 has his truck’s front end destroyed after a collision during the SPEED Energy Stadium Super Trucks at the Acura Grand Prix of Long Beach weekend in Long Beach Saturday, April 13, 2019. Photo by Thomas R Cordova. 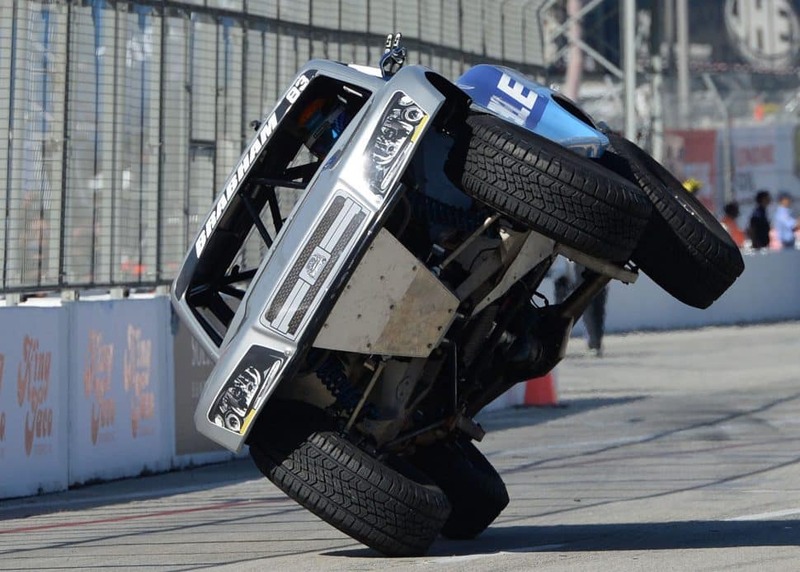 Blade Hildebrand #68 comes in with a damaged front end during the SPEED Energy Stadium Super Trucks at the Acura Grand Prix of Long Beach weekend in Long Beach Saturday, April 13, 2019. Photo by Thomas R Cordova. 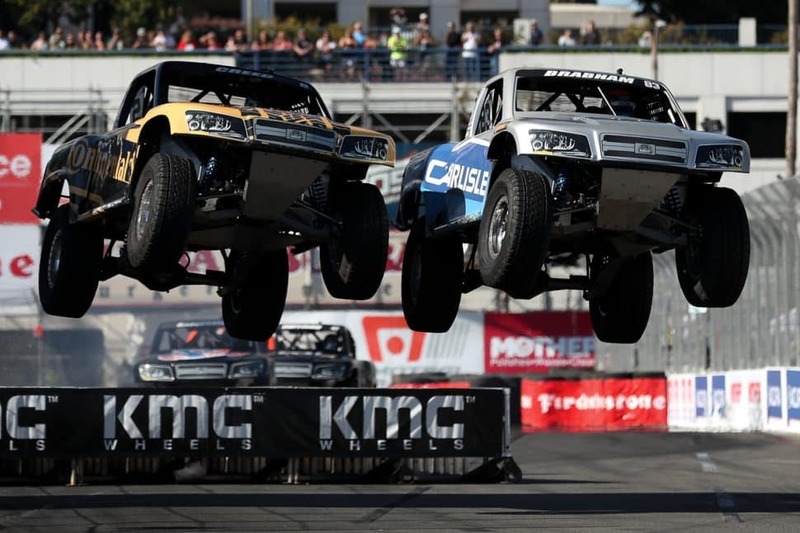 Sheldon Creed, left, and Matt Brabham fly through the air during the SPEED Energy Stadium Super Trucks race at the Acura Grand Prix in Long Beach on Saturday, April 13, 2019. Photo by Kelly Smiley. 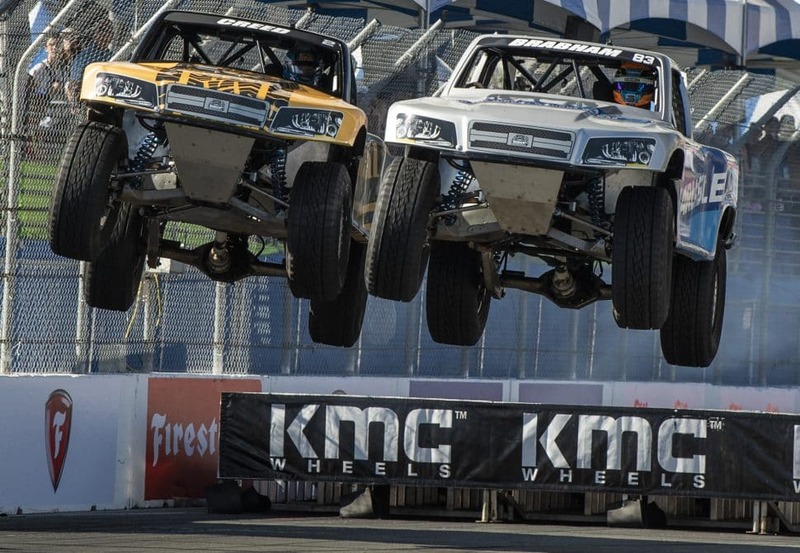 Matt Brabhm, #83, and Sheldon Creed, #2, get some air during the SPEED Energy Stadium Super Trucks race, at the 45th Acura Grand Prix of Long Beach, Saturday, April 13, 2019. Photo by Stephen Carr.